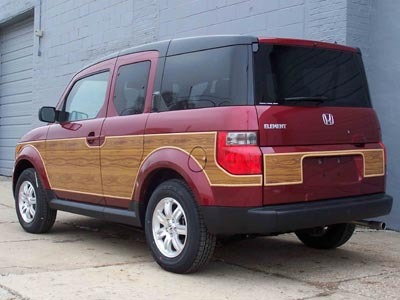 Our new Honda Element “Woody” Kit recalls those great “wood” Wagons of the past that started the whole S.U.V. movement. This kit is designed for the Element with the painted plastic panels. The timeless design and long history of woodies as the rugged work-horse was forever changed to include luxury appointments and comfort. Our new “Woody” kit projects the same image while being even more exclusive than the original. The “wood” panel material (simulated Cheyenne Teak) with an additional UV Laminate and the “wood” outer edge trim (simulated Santa Rosa Oak) is manufactured to ISO 9001 standards. The combination of high-quality vinyl panels and extruded trim is not only beautiful, it is also maintenance free. Our Honda Element “Woody” Kit is designed for the home installer, or can be installed by your local body shop. All components are pre-formed, labeled, and detailed photo-illustrated instructions are provided. Also, tech help from our professional installers is only a phone call away. All the materials provided are OEM approved and manufactured in North America at ISO 9001 facilities. The use of high quality application specific materials permits us to offer a 3 year warranty against defects in workmanship and materials.